To get started, rez a Barnyard Bird Starter nest from your inventory on the ground. Click the nest and select the "birth" option to rez your new baby chick. Your new chick has a default range of 5 meters from "home" which is the spot where you birthed them. To move your chick just select edit and move, or the chick can be taken into inventory and re-rezed to the new location. To set home position in the future click the chick, select settings, set home. Home position does set automatically on rez when you re-rez a Barnyard Bird. The Range is set in Meters and is the radius of a circle with the home point as the center. (The Radius of a circle is measured from the center to its edge). From birth to 3 your chick will be either a red, black or yellow baby chick then at age 4 they will get their adolescent textures which they will keep until the age of 6. When your Barnyard Bird reaches age 7 it will receive its adult textures and all the traits you see on the stats of your Barnyard Bird will become visible on the Bird. When your Barnyard Bird reaches age 5 their vigor will begin to rise if their vivacity is at 85% or above. Once their vigor reaches 100% and is also age 7 they will be able to mate. In order to have a successful mating both Barnyard Birds need to have 100% vigor, 85% or higher vivacity and be awake. When these conditions are met the Birds will mate and the female will drop a nest without a pregnancy period. You will see on the Birds stats that each Bird has cycles; the Birds start out with 12 cycles and with each nest that is dropped by the female Bird each parent will lose a cycle from their stats. After having the Barnyard Bird Nest there will be a 3 day “nesting” period for both the male and female Barnyard Bird. After the nesting period is completed it will then take approximately 2 days for the Barnyard Bird to reach 100% vigor provided they have vivacity of 85% or higher. When your Birds drop their own nests those will be non-starter Barnyard Bird nests. An incubator is used for hatching your non-starter Barnyard Bird Nest. The non-starter nest will take 60 minutes to birth after being sent to the incubator. The incubator can birth up to 12 Barnyard Birds at one time so it is recommended if you are going to be offline to have food sitting near the incubator. While the eggs are in the incubator you can click the button called list UUID’s this will list all UUIDS of the Barnyard Birds that are birthing. 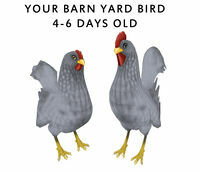 If you have a Barnyard Bird that cannot rez due to lack of prims please give the incubator time as it will also re-rez the Barnyard Bird when the prims are open. Please DO NOT send Barnyard Birds, notecards or instant messages to the Amaretto staff or the creator the ONLY way we will be able to assist you is if you file a ticket on the support site. If you are having issues with your Barnyard Bird not eating please try the following tricks before filing a ticket. 2. If the land is set to a group, are the Barnyard Bird and food set to that group? 3. If the land isn't set to a group, are the Barnyard Bird and food set to the same group as each other? Remember your Barnyard Bird only eat once every 43 minutes so you may not notice a change immediately, be patient it takes 4 days for a Barnyard Bird to reach 0% hardiness. When selling your Barnyard Bird all you need to do is click the sale box and insert the price, NO OTHER PERMISSIONS NEED TO BE CHANGED. This also applies to zero sales or transferring your Barnyard Bird to a friend. This page was last edited on 11 October 2018, at 22:39.